Be one of the few to see the solar panels on top of Stinson-Remick Hall and enjoy the great view of campus from this vantage point. Installed in 2009, the solar panel system is rated at 50 kW and provides an estimated 55,000 kilowatt-hours of carbon free electricity annually. Before heading to the rooftop, graduate student Rebecca Scheidt (Kamat Lab) will give a presentation on solar energy. 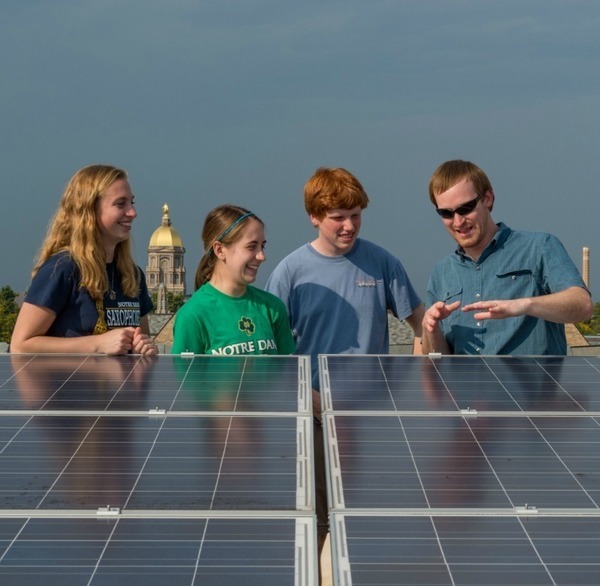 Tours are limited to Notre Dame students, faculty, and staff. Participants will meet in 100 Stinson-Remick Hall. Plan to arrive a few minutes early to complete a waiver form. The solar panel tours have reached capacity, and registration is now closed.